Bluesmobile replica at House Of Blues in Dallas. The Bluesmobile is a 1974 Dodge Monaco sedan that was prominently featured in the 1980 Universal Pictures film The Blues Brothers. The car is described as a decommissioned Mount Prospect police car, purchased by Elwood Blues at an auction after he had traded a previous car (a 1968 Cadillac Sixty Special) for a microphone. The Bluesmobile is equipped with a "440 Magnum" engine and squad car package, an option offered by Dodge for the Monaco in 1974. It bears an Illinois license plate reading "BDR 529", a tribute to the Black Diamond Riders motorcycle club of Toronto, Canada. Dan Aykroyd, co-writer of the film, stated that he chose the 440 Dodge Monaco because he considered it to be the hottest car used by police during the 1970s. In describing the car to his brother Jake Blues, Elwood says, "It's got a cop motor, a 440-cubic-inch plant. It's got cop tires, cop suspension, cop shocks. It's a model made before catalytic converters so it'll run good on regular gas." The Bluesmobile has the ability to perform seemingly impossible stunts, such as jumping over an open drawbridge, flipping backwards in midair and even "flying" for very brief periods of time. However, its cigarette lighter does not work; when "Joliet" Jake Blues discovers this early in the film, he throws it out the window. In The Blues Brothers opening scene, Elwood arrives at Joliet Prison in the 1974 Dodge Monaco to pick up the newly-released Jake. When Jake asks about their previous Bluesmobile, a 1968 Cadillac Fleetwood, Elwood tells him he traded it for a microphone. Elwood explains the Dodge Monaco is a decommissioned Mount Prospect police car, and after proving its worthiness by jumping it over the 95th St. Bridge in Chicago, Jake approves it as their new Bluesmobile. The film used 13 different cars to depict the Bluesmobile, all of which were former police cars purchased from the California Highway Patrol, and were mocked up to look like former Mount Prospect, Illinois patrol cars. Some were formatted for speed, and others in jumps or high-performance maneuvers, depending on the scene. One was designed simply to fall apart upon its arrival at the Cook County Building. A mechanic took several months to rig the car for that scene. Over 60 old police cars were purchased for the film's chase scenes, and the production kept a 24-hour body shop open to perform repairs as needed. At the time of the film's release, it set a world record for the most cars destroyed in one film; it held this distinction until 1998, when it was surpassed by its own sequel. According to Dan Aykroyd, the horn-shaped loudspeaker atop the Bluesmobile was actually a duplicate of a massive Cold War-era air raid siren installed in the schoolyard at "Our Lady of Annunciation" where Aykroyd attended elementary school while growing up in Ottawa Canada. 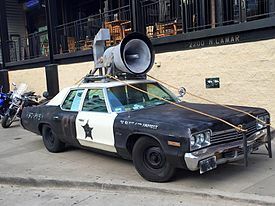 The siren was manufactured by a Canadian company called CLM Industries, and Aykroyd specifically requested the same CLM model be used in the movie to portray the loudspeaker the characters affixed to the top of the Bluesmobile and used as a PA system. The Blues Brothers use the Bluesmobile to evade pursuers in a number of high-speed chases throughout the film, culminating in a police pursuit / race to Chicago after the band's performance north of the city. Even though the car throws a rod during this pursuit, they are still able to outrun both the police and a group of Neo-Nazis in a pair of Ford station wagons. After they crash through the Richard J. Daley Center and arrive at the Cook County Building to pay the property taxes on the orphanage where they grew up, the car falls to pieces on the sidewalk. Director John Landis has claimed that the portion of the final chase sequence beneath the elevated train tracks, which briefly showed a reading of 118 miles per hour (190 km/h) on the car's speedometer, was actually filmed at that speed, a testament to the Monaco's police car heritage. He has also stated that he re-shot some of the scenes with pedestrians on the sidewalks, so viewers could see that the film had not been sped up to create the effect of speed. The vehicle's model is never referred to in the original film by Elwood, who purchased the car, or the various police officers and dispatch operators coordinating the manhunt. It is only referred to as a "1974 Dodge sedan" over the CB, and as "that shitbox Dodge" by one of the state troopers pursuing Jake and Elwood throughout the film. In the extended version of the film, Elwood is seen parking the Bluesmobile in an electric substation that was used to power Chicago's elevated trains. In the documentary "Stories Behind the Making of the Blues Brothers", Dan Aykroyd suggested that the scene was intended to show the Bluesmobile was getting "power" from the substation, which would help explain how it was able to do impressive stunts. In the original theatrical release, director John Landis had cut that scene to shorten the length of the film. According to Landis, there was no need to explain the car's powers. To him, it was simply "a magic car" and of course, they were on a mission from God. A power station was visible in the background of the film's poster. The name "Bluesmobile" was also given to another former police car, a 1990 Ford LTD Crown Victoria, used in the 1998 sequel, Blues Brothers 2000. In the film, Elwood purchases the car from Malvern Gasperon's yard in Chicago for $500. The car was equipped with a 190 hp 351 cubic inch engine, 4-speed automatic transmission and full optional Police Package including front bullbar, canine cage insert, and Appleton spotlights. Livery is a classic "Black & White" paint theme common to many American police departments; in this case, very similar to the California Highway Patrol's K-9 unit, with "safety and service" motto on the fenders. Blues Brothers 2000 sought to outdo the original by including a number of outrageous stunts. The new Bluesmobile was depicted as having abilities such as functioning like a submarine in deep Mississippi water, having radio-control capabilities, and jumping about 300 feet over a road construction site. The new film claimed the world record for the highest number of cars destroyed at 104, beating the record set by The Blues Brothers. In the film's major crash scene, 63 cars were destroyed. While filming another scene, stuntman Bob Minor suffered serious head injuries and a crew member required a leg amputation after a car rolled on to him. The first Bluesmobile, a 1974 Dodge Monaco, was marketed by various manufacturers in a number of die-cast versions. A die-cast model of the second Bluesmobile, a 1990 Ford LTD Crown Victoria, was marketed by the Johnny Lightning model car brand. ^ Yves Lavigne (1989). Hell's Angels: "Three Can Keep a Secret If Two Are Dead". Carol Publishing Group. pp. 155–. ISBN 978-0-8184-0514-3. ^ "In Search of the Bluesmobile". DieCast Magazine. Summer 2008. p. 98. ^ Modin, Flash. "The Physics of the Blues Brothers". Physics Buzz. American Physical Society. Retrieved 14 May 2018. ^ Doug Gelbert (1 January 2002). Film and Television Locations: A State-by-state Guidebook to Moviemaking Sites, Excluding Los Angeles. McFarland. ISBN 978-0-7864-1293-8. ^ a b "Chicago Sun-Times". Incredible stunt driving: "That was all real". Archived from the original on July 28, 2005. Retrieved December 16, 2006. ^ Paul, Adam. "Dan Aykroyd marks 35 years since The Blues Brothers". stlawrencefilm.com. ST. LAWRENCE INTERNATIONAL FILM FESTIVAL. Retrieved 29 December 2017. ^ "What Link Do Our Old Air Raid Sirens Have with the Blues Brothers?". southsidestory.ca. South Side Story. Retrieved 29 December 2017. ^ "THE BLUES BROTHERS MOVIE CHICAGO PREMIER 6/16/80, 35 YEARS AGO". Blues Brothers Approved Ventures LLC. Retrieved 29 December 2017. ^ "Blues Brothers: Collector's Edition,". ign.com. IGN. Retrieved 29 December 2017. ^ Chiarella, Chris. "The Blues Brothers Blu-ray Review". Big Picture, Big Sound. Retrieved 29 December 2017. ^ Henriksson, Joakim; Henriksson, Madeleine. "Bluesmobiles in the movies The 1990 Ford Crown Victoria". Bluesmobile.info. Retrieved 29 December 2017. ^ a b "Cars from Movies – The Blues Brothers' Bluesmobile". Cool Rides Online. Gold Eagle Co. Retrieved 29 December 2017. ^ Hawkes, Rebecca. "The greatest movie car stunts of all time, and the stories behind them". The Telegraph. The Telegraph. Retrieved 11 May 2018. ^ Kadel, Jessica. "9 of the Biggest Car Crashes In Films". Rybrook Driver's Life Magazine. Rybrook Holdings Ltd. Retrieved 11 May 2018. ^ Paul Brent Adams (15 November 2016). Film and Television Star Cars: Collecting the Die-cast Models. Amberley Publishing. pp. 97–. ISBN 978-1-4456-6211-4. ^ "January 4th - the Bluesmobile (Blues Brothers 2000)". A Toy A Day. Retrieved 29 December 2017. This page was last edited on 16 January 2019, at 03:03 (UTC).